If you want a relaxing stay in an authentic walled Berber town look no further than the medieval town of Taroudant. It lies beside the High Atlas mountains in the Sous Valley in the southern part of Morocco and it has retained its authentic Berber character and roots. Taroudant is well placed as a base for exploring the region to the east of Agadir and its beaches, it is on the road to Ouarzazate and the Sahara desert and adrive over the dramatic Tizi n'Test pass to Marrakech. 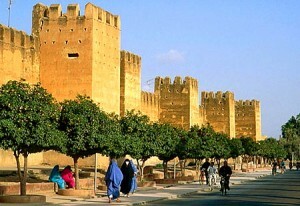 It is said to resemble a smaller version of Marrakech with its walls and ramparts surrounding the city. For a very short time Tarodaunt was indeed the capital of the Saadian dynasty used as a base for attacking the Portuguese in Agadir. The Saadians then moved to Marrakech. Taroudant saw its golden age during the reign of Mohammed ash-Sheikh who constructed the city walls and built the great mosque and its minaret in 1528. Taroudant unlike the imperial cities of Fes, Marrakech and Meknes does not have a ville nouvelle, a modern part of town, which greatly adds to its authentic ancient atmosphere and charm. It has a population of around 70,000 but retains its small market town character. Taroudant remains a traditional Berber fortified town enclosed by its ramparts which are the best preserved in Morocco, nearly 6 kilometres long with bastions and nine gates that still remain intact. A perfect way to see the town walls is to take a horse drawn caleche or hire a bicycle. It was an important staging and trading post on the ancient camel trading route and there is still a small tannery outside the ramparts selling products made from camel hide such as leather bags,sandals and belts. The town is well known for its quality leather products. Its souks are welcoming and relaxed and excellent value for discerning shoppers, especially for local crafts and Berber and Tuareg jewellery, for which it is renowned. Prices here are significantly less than in the big cities like Marrakec and Fes. There are souks near each of the two main squares, Assarag and Talmoklate. There is also a weekly souk outside the city walls, near the new university district. Taroudant has always benefited from the diverse agricultural produce from the Souss and remains a local market town .The Berber market, called Jnane al-Jaami, sells spices and dried fruits but mostly clothes and household goods. The Arab souk, however, specialises in handicrafts such as terracotta, wrought iron, pottery, brass and copper, leather and carpets, rugs and jewellery. It is a place to gain a real insight into Morocco's everyday culture and environment. It has a very equitable climate in winter and in summer it is cooled by the current from the Canaries. It is therefore no surprise that Taroudant is home to some of the best hotels in the south of Morocco; they include the the exclusive haunt of the rich and famous, the Hotel Gazelle D'Or, which began as hunting lodge for a French baron in the 1920's and was converted into a hotel after the Second World War, it has superb grounds. Other well known hotels include the Dar Zitoun and the Hotel Palais Salam and there is a full range of hotel accommodation in town. The Riad al Hossoun also comes highly recommended and has a superb garden and views of the Atlas Mountains. Activities outside Taroudant include visiting Berber villages in the foot hills of the High Atlas and Anti Atlas mountains and the Oases and experiencing the wild life and birds in the Souss Massa National Park The village of Tioute 36 kms from Taroudant has a Kasbah on a hill which has been partly converted into a restaurant area with a pool which is alluring in the summer heat. The ancient fortified village of Freija is 11 km from Taroudant also has a Kasbah, now the Riad Freija. Thanks for exploring your post description with the Morocco Travel Guide services. Whenever we think to travel here and there in the desired location, there is having need of any experienced guide.